Khayangan Estate is a unique grouping of luxury villas, antique joglos from Kudus in Central Java, saved from destruction and transported to the southern tip of Bali and carefully restored to preserve their unique characters and authentic features, which make them unlike any other Bali villas. Ancient preserved teak has been used throughout the estate, from the roofs and walls, to the flooring and furniture. Our aim is to be the best of the Bali luxury villas by harnessing Indonesia's great cultural heritage and the charming hospitality of the Balinese people. 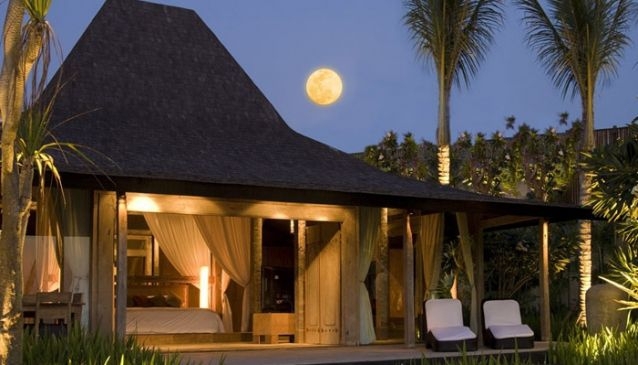 We offer you the comforts and privacy unique to Bali luxury villas, in one of the most enchanting holiday destinations in the world. This is a place of mesmerising beauty with cliffs over 170 metres high, rolling surf, pristine white sand beaches, and magnificent 180-degree views of the Indian Ocean, away from the madding crowd and offering complete privacy and security. 6 ultra-lavish bedroom suites with the most romantic en-suite bathrooms. 6 grand living and dining pavilions. 2 large infinity-edge swimming pools. Fully equipped modern kitchen, private office, gymnasium. A library of books, DVD's and board games.